Tentworld: Just out! The Limited edition 50th Anniversary Gold Series Engel MT45FG! Just out! The Limited edition 50th Anniversary Gold Series Engel MT45FG! The new MT45FG has some fancy new features to impress your mates. We've just received our first batch of the 50th Anniversary Limited Edition Gold Series ENGEL MT45 FG Fridge/Freezer and I tell you what, they've gone and made all the improvements we had wished for. 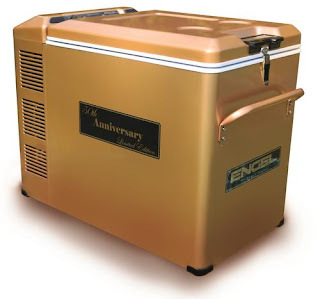 ENGEL have released this fridge to celebrate their 50th year of dedicated service to Australians. Digital Thermostat control - this means no more adjusting the dial to find the sweet spot for achieving your desired temperature. You simply adjust the dial to reflect the temperature you want, and the ENGEL will make sure it achieves this. Set and forget. Battery Monitor with low battery cutoff - takes the guess work out of knowing how much charge is left in your batteries. The low battery cutoff can be turned on or off depending on your needs but is there to prevent damage to your battery and fridge that can sometimes result from your fridge running the battery too low. 50th Anniversary Black and Gold Insulated Transit Bag - the transit bag is essential for any fridge owner. It helps your fridge run efficiently, and it keeps your fridge in pristine condition taking the brunt of any knocks, bumps or rubbing often caused when travelling on the road. Auto Switching - the fridge will auto select the best power source on availability. Rugged steel casing, still lid and handles that double as tie down points. The Engel MT45FG Gold Anniversary Edition is no longer available.